♫ Enrollment is offered free of charge by the Flagler County School District. ♫ Students may elect to play violin, viola, cello, or doublebass. ♫ All experience levels are welcomed, including beginners. ♫ Classes are held at Indian Trails Middle School twice a week on Mondays and Wednesdays in one-hour sessions from 3:30 pm to 6:30 pm (classes begin at 3:30, 4:30 and 5:30 pm.) Some class scheduling restrictions apply. ♫ Open House is scheduled for Wednesday, September 5th at 5:30 p.m. Information on instrument sales and rentals from area music stores will be available at this event. All students planning to join or are interested in learning more should attend. ♫ Deadline to enroll for the 2018-19 season closed on Monday, September 17th. ♫ Online enrollment is closed. 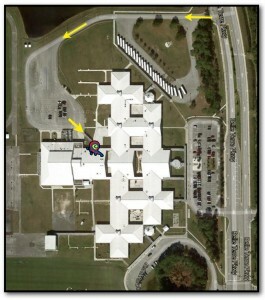 Location of September Open House entrance at Indian Trails Middle School. Students will learn about the enriching world of classical music, as well as many other genres, while receiving string instruction in a player-friendly environment. All members, even beginners, will participate in performance opportunities organized throughout the year. Join the fastest growing, most exciting music program in Florida. For questions about the program, instrument rentals or scholarships, call Cheryl Tristam at 386-503-3808, or send an email to cheryl@flagleryouthorchestra.org. We need your enrollment form by August 8th, 2018. Online enrollment is available at this link. Be sure to read the confirmation page once your enrollment is submitted. This page includes a link and access code to the audition sign-up page. Visit the audition materials page for information about class assignments and materials to prepare for the audition process. Auditions begin on Monday, August 20th. *Are you from a neighboring county? Call to learn about our fee-based out-of-county enrollment.